Successfully Added Nail Polish Dryer - 60W LED, 395 to 405nM UV Wavelenght, 4 Timing Modes, Safe To Use, LCD Display, 50000 Hour Service Life to your Shopping Cart. Spoil yourself with this high-end nail polish dryer and make sure that your nails always look spick and span. This beauty accessory allows you to make your nails like never before. Thanks to its powerful 60W LED light, this nail dryer strengthens your nail polish in a precise and efficient manner. It features a stylish design and has been crafted out of a strong aluminum alloy. Thanks to this, it is extremely durable. With a lifespan of up to 50000 hours, this nail dryer can be used for numerous of beauty sessions. From now on, you and your friends can fully enjoy your girl nights by spoiling each other with beautifully made nails. 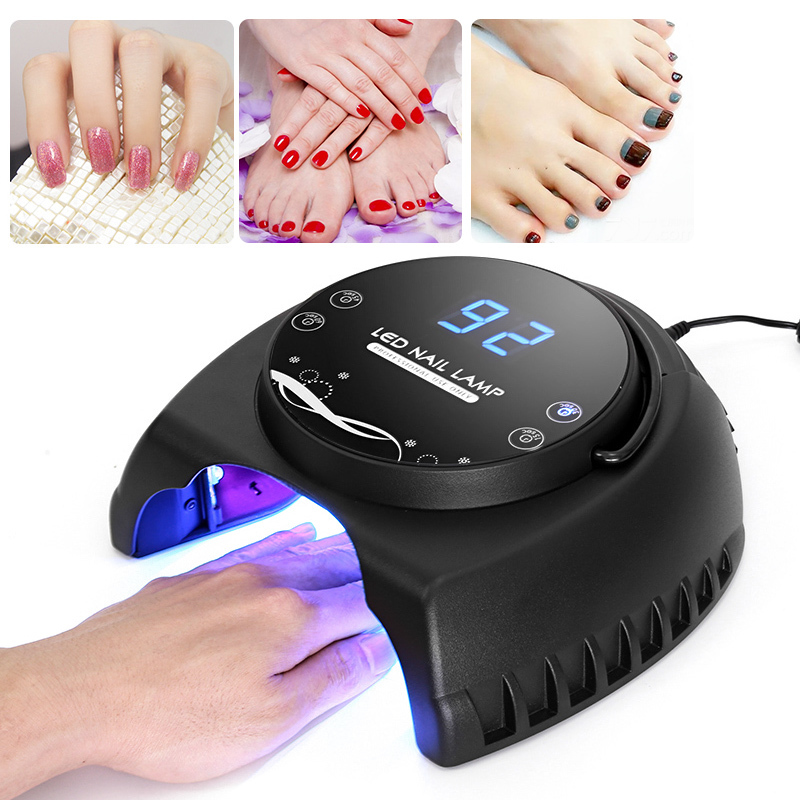 This nail dryer features an UV wavelength of 395 – 405nM. With this ultra-bright light, it dries your nails in the blink of an eye. Four different timing options allow you to provide the perfect treatment to your nails. Thanks to its large design, this nail polish dryer can be used perfectly for both hands and feet. This provides you with unlimited options to decorate all of your nails. For those of you that are looking for a nice little gadget to upgrade their personal manicure kit, this nail dryer is the perfect beauty accessory. Built within the body of this electronic gadget you’ll find a large LCD display. This screen will constantly show you the remaining time of your nail drying process. Like this, you can be assured that you’ll never heat up your nails for too long and break the polish. A fast heat discharge setting makes your nail polish hardener safe to use. It offers a stable performance and is guaranteed to make your nail polish stand out like never before. This nail dryer comes with a 12 months warranty, brought to you by the leader in electronic devices as well as wholesale electronic gadgets..
Arabic: - مسمار مجفف - Chinese Simplified: - 指甲烘干机 - Czech: - Sušička na nehty - Danish: - Negle tørretumbler - Dutch: - Nagel droger - French: - Dessiccateur d’ongle - German: - Nagel-Trockner - Hebrew: - מסמר מייבש - Hindi: - सुखाने की मशीन कील - Italian: - Essiccatore del chiodo - Japanese: - 爪ドライヤー - Korean: - 못 건조 기 - Malay: - Kuku hawa - Norwegian Bokmål: - Nagle Dryer - Romanian: - Unghii uscator - Russian: - Сушилка ногтей - Spanish: - Secador de uñas - Thai: - เครื่องเป่าเล็บ - Turkish: - Kurutma makinesi çivi - Vietnamese: - Móng tay máy sấy.